We ate a lot of Rice Krispies when I was a kid. In 1991, you could mail in proofs of purchase and get this adorable little My Little Pony. So Baby Stockings was, I believe, a Christmas present that year. She acquired a jingle bell around her tail and has hung out on all my Christmas trees since. 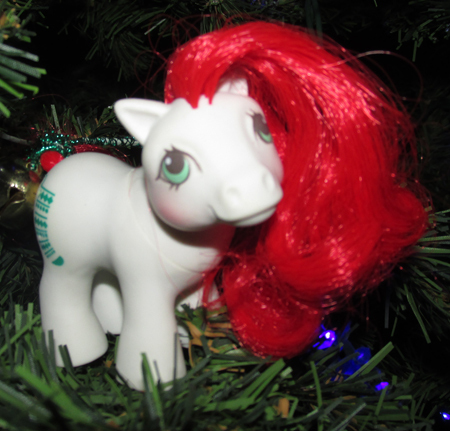 She’s not an ornament, but she’s a baby pony and the perfect size to perch on a tree branch.